The Hamners’ Unbelievable Magic Show in Branson is a family-friendly show packed with non-stop entertainment and moving musical numbers. This amazing show brings to Branson stage a unique blend of acts, color and excitement where birds appear, people fly, and voices soar in a superbly executed performance of magical acts and unbelievable talents from beginning to end. This magic show in Branson is an all new production and is not just your standard variety show, you will be seeing amazing feats of magic, edge-of-your-seat acrobatic acts, exceptional vocals, and outstanding ventriloquism. This variety show will truly give you unmatched, quality entertainment. From the opening musical presentation and amazing “Grand Illusion” to their amazing patriotic finale, you are sure to be mystified by magic, serenaded by harmonious songs, and swept away by acrobats and dramatic singers and dancers. In Branson, there’s only one show, The Hamner’s Unbelievable Magic Show that features a fun-packed entertainment into one unbelievable show. 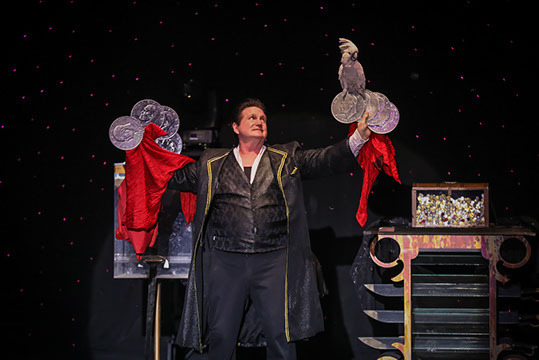 The front-runners of the variety show, Dave and Denise Hamner have headlined many major production shows around the world, by presenting their award-winning show with original feats of magic. This unbelievable magic show in Branson is packed with so many amazing acts. This magic show have appeared in many popular venues such as in Las Vegas, Disneyland and Hollywood’s famous “Magic Castle,” and now they’ll perform in Branson where they starred in the productions Branson City All Star Revue and Magic of the Night. This amazing group have also appeared on Trinity Broadcasting Network and NBC’s Worlds Greatest Magic. For the past decade, the Hamners have co-owned and co-produced the Hamner Barber Variety Show. They have received also the prestigious “Magic Masters Award” by their peers in magic in Las Vegas, Siegfried and Roy, who personally honored them by presenting to them the “Bronze Lion Head Award” for their excellent performance. In addition to the amazing magic performances of the Hamners, you’ll be treated to outstanding vocals of Tamra Tinoco, who once scored runner-up position in the Miss Missouri pageant. This beautiful singer has appeared on the Grand Ole Opry and as a guest of the legendary Porter Waggoner. Tamra had also worked with artists like John Davidson, Jim Stafford, Ferlin Husky, Vince Gill, and The Osmonds. This show will give you so much fun once you see dance numbers choreographed by AJ Heard and Ken Brown. The world-renowned illusionists Dave & Denise Hamner will perform a variety of illusions that include “their one of a kind act” in which they perform along with beautiful Macaws and Cockatoos that appear mid flying cards, flaming words, falling coins and jewels and they fly over the audience. You will see original illusions such as “Stargate,” “The Lightning Levitation,” “Vertigo,” “The Fall Death” and an absolute magical “Veterans Finale.” This amazing show will become “unbelievably” magical when that magic is seamlessly blended in and highlighted with the other amazing acts in the show. The Hamners’ Unbelievable Variety Show is a unique show in Branson that is filled with magical and acrobatic acts, incredible music and dance acts, and amazing ventriloquism.